The Queensland Federation of Aquarium Societies (QFAS) is holding another combined clubs super auction this Saturday! There'll be plants, live foods, Australian & PNG natives, Africans, Americans, Bettas, livebearers, catfish, community tropicals and who knows what else... And it's all staffed by volunteers, so all of the funds raised through commissions and the canteen go directly towards supporting the clubs that support the hobby. If you are Selling enter via Kate Street where the signs for Indooroopilly Montessori & RiverGlenn (seller check in from 2:00-5:00pm). Follow the road around to the pool on your left, there is a small bus shelter on right for drop off and hall is behind. There are 2 paths the one on the right hand side doesn't have steps. If you are buying or just looking go to Witton Road into Bridge street Car park on the right. Nudgee Junior College, Kate st Indooroopilly. Fish & other items in at 2.00pm-5pm. Auction starts 4.00pm. COMMUNITY groups and schools are being encouraged to host an event for the inaugural Connect to Your Creek Week. Community groups and schools are being encouraged to host an event focused on their local creek. Healthy Waterways chief executive Julie McLellan said the aim of the campaign, from May 17-25, was to improve waterway health by increasing community stewardship of local waterways so people valued and cared for their local creek. "Throughout the week, there will be a variety of events across South East Queensland to celebrate the diversity and beauty of our waterways," she said. "We encourage all community groups and schools to join us by hosting an event focused on their local creek." Examples of events that groups might host include tree plantings, kayaking tours, litter cleanups, guided walks, documentary screenings and workshops. People have until February 24 to register their interest in hosting an event by completing the online form at http://www.healthywaterways.org. Environment Minister Andrew Powell said the Queensland Government was proud to partner with Healthy Waterways on the exciting new initiative. "One of the many reasons people love living in Queensland is our beautiful environment and our outdoor lifestyle," he said. 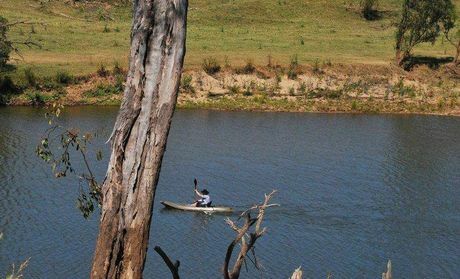 "In south-east Queensland our waterways play a major role in the way we enjoy ourselves outdoors. Whether it's visiting a cafe near the Brisbane River or taking a family camping trip near a favourite creek or waterhole. "I look forward to celebrating our connections to our favourite waterways and attending some of the Connect to your Creek Week events." If you missed the ANGFA convention in Melbourne don't dispair, our assistant editor Leo O'Reilly gives us the run down in this issue of In-Stream. Our editor Adrian Tappin introduces the mysterious and beautiful "Red Neon" Blue-eye thought to have originated in West Papua and yet to be formally named. We take a close up look at Cherax quaricarinatus, the Reclaw Crayfish, and Adrian shows off a fabulous exposé of watergardens as a celebration of Spring. As always, if you have an interesting story or photo to share we'd love to hear about it - so please contact us if you'd like to contribute to In-Stream. This Saturday (October 26th) at the Bar Jai Hall (178 Alexandra Road Clayfield) QFAS, the Queensland Federation of Aquarium Societies, is holding its first ever Market Day. QFAS has been running combined clubs fish auctions for as long as most of us can remember, and while the fast pace of the auctions is tons of fun, most of us that have been to a few can remember back to at least one purchase that makes us question what we were thinking when we put up our hand to bid - and I know I usually have a pretty slow Sunday after an auction that's run into the wee small hours of the morning. So for the first time QFAS is slowing down the pace and not keeping us up all night. At this Saturday's market day you'll be able to take your time to peruse the fish and aquarium wares on offer, and meet the sellers - most of whom are breeders, hobbyists, and/or suppliers. It shaping up to be a great day out for novices and seasoned aquarists alike - and for a change it's an event that's family friendly, so bring the kids along. The next ANGFA Queensland meeting has been postponed to Friday, October 18. The Melbourne Convention was a roaring success so this meeting we'll have a run down from some of the ANGFA Queensland members who attended, thank-you ANGFA Victoria. We'll also take a trip down memory lane with some of Doug Collom's videos about fish keeping, and fish from the Brisbane River. If you’re not a member please feel free to come and have a look, you can join on the night if you're interested. The club shop with dry goods and supplies will be open, as will the drinks stand. There’ll be an auction after the talks where anyone can buy, though you must be a member to register as a seller. The next ANGFA Qld meeting is at the Bar Jai hall – 178 Alexandra Road, Clayfield. Friday night 18/10/2013 starting at 7:30 pm sharp! Sorry, this content is restricted to members of ANGFA Qld. Log in or register if you'd like to access this content. In this issue of In-Stream we travel with Adrian Tappin west of the Great Dividing Range on Cape York Peninsula in Far North Queensland to visit the Ducie River as it makes its way into the Gulf of Carpentaria. We also get up close and personal with some the most beautiful, interesting and/or unusual inhabitants of Australian freshwaters (and sometimes aquaria). This time the focus is on Blind Cave Gudgeons, Giant Jungle Prawns (Macrobrachium lar), Blue Stream Gobies (Sicyopterus lagocephalus), and Mudmat (Glossostigma). Make sure you find the cryptic creature featured in the cover photograph of this issue too - just another example of what makes Australia waterways so special 😉 .